Miranda Hart is to return to the BBC's Call The Midwife for the 2016 Christmas special and the sixth series, which is expected to air in 2017. Hart will again play the period drama's popular character of midwife Camilla "Chummy" Fortescue-Cholmeley-Browne. Hart, who had been in the show since it began in 2012, left in series four due to her work commitments. Call the Midwife is one of the BBC's most popular series with an average audience of nearly eight million. The drama is based on the best-selling memoirs of the late Jennifer Worth and revolves around the work of midwives in east London in, and from, the 1950s. A spokesman for the drama's production company said everyone on the team had "been bursting to share the news" of Chummy's return. 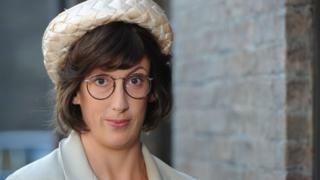 "We're thrilled to be once again featuring Miranda Hart and her fabulous blend of warmth, strength and vulnerability, as Chummy gets to grips with the medical and social challenges of the 1960s," he said. Hart, who became a household name for her hit sitcom Miranda which ran from 2009 to 2015, spent much of 2014 on tour with her one-woman show. She then expanded her repertoire by turning to Hollywood and appeared in 2015's action film Spy, alongside Jason Statham, Melissa McCarthy and Jude Law. However, Hollywood's gain was Call The Midwife's loss as it meant Hart was forced to miss most of series four, series five and last year's Christmas special. Her absence had to be written into the storyline which saw her moving to a mother and baby unit. At the time, Hart said: "I am very sad not to have been able to be involved in series five but, on the plus side, maybe Chummy can come back in the next series an enlightened, crazed '60s hippy, having an affair with Paul McCartney." Call the Midwife, which has won a handful of awards and has been nominated for two TV Baftas, also stars Helen George, Jessica Raine, Jenny Agutter, Pam Ferris and Bryony Hannah. In series six, the midwives will be seen working partly in South Africa, where filming in Cape Town has already begun.